One of the flotilla of vessels required to work with the pipe-laying ship SOLITAIRE, due to arrive shortly, passed Cloch Point bound for Glasgow on Sunday morning and headed upriver to join MANTA III at Shieldhall. MALAVIYA THIRTY is an Indian-owned offshore platform supply vessel, built in 2006 by Akers Yards at Brattvaag in Norway. 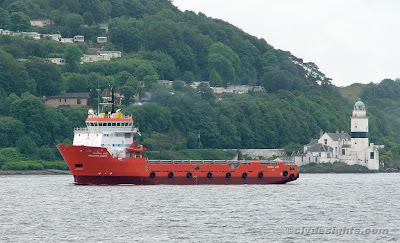 She is owned by Great Offshore Ltd and will be transferring equipment to SOLITAIRE at one of the Lower Firth anchorages. MALAVIYA THIRTY is 3,300 tonnes deadweight and has an overall length of 72.2 metres. She is one of the popular Ulstein UT755 class of supply ships.